As with live firearm maintenance, airsoft guns need some lovin’ too! So many people think that airsoft guns are toys, but they are far from it! They have working parts and are live fire replicas that need the same level of maintenance and cleaning. Read on for some tips to cleaning your guns. 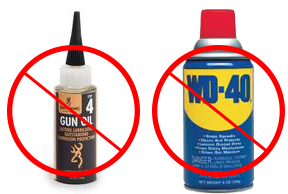 DO NOT LUBRICATE YOUR GUN WITH WD-40 OR GUN OIL! The proper lubricant for airsoft guns are high-grade silicone oils or sprays. Anything else will gather dirt, dust and debris, gunk up your barrel and gearbox and cause corrosive damage to your gun. Stick to Silicone Oil and Spray! Airsoft gun barrels DO need to be cleaned to keep bbs flying steady and straight. You can usually tell its time for a good ol’ fashioned barrel clean when your bbs start to travel upwards out of the barrel. Grab your cleaning rod and a strip of paper towel. Push the paper towel wedge through the eyelet on your cleaning rod and spray the towel with silicone oil. Insert the rod into the barrel spinning the rod as you travel through the barrel, then back out. Grab another piece of clean paper towel and place it through the rod eyelet. Repeat the spinning within the barrel to remove any extra oil from the barrel and ensure all the debris and goop is cleared from your barrel. When it comes to issues with misfeeding or jamming, it typically means the hop-up needs a good lubrication. Remove your magazine and fire a few shots to ensure your gun has no bbs in it at all. Place your gun on a surface upside down with the magazine well facing up. Place the red spray straw of your silicone spray slightly into your hop up and spray once or twice. Don’t use too much!!! Let your gun sit for a few minutes so the silicone can settle throughout the hop up unit. Gearboxes may also need some lube lovin’ every once in a while too. Most gearboxes come from the manufacturer packed full of industrial strength grease or white lithium, but if you notice a whining sound or are doing general gearbox maintenance, it can’t hurt to head in there and do some spring cleaning. To lubricate your gearbox, remove the motor and peer down the motor casing. You’ll see a small hole where the motor enters the gearbox. Place your silicone spray stray into the hole and spray three or four times. Leave your gun upside down to allow the silicone to run throughout the gearbox and get in all those nooks and crannies. Silicone oil is a necessity for any airsoft gun owner, especially if you are running with gas guns! Airsoft gas magazines rely mainly on rubber gaskets and o-rings in order to run, so they need to be cleaned and lubed often to keep the gasket’s expansion working and will help to keep the gun from expelling or venting gas unnecessarily. To lube your gas mag, spray silicone oil into the port at the top of the mag and press the valve on the side up and down a few times to allow the oil to seep down onto the inner gasket. Lubing the fill port on the bottom of the mag should also be done. 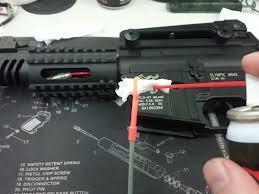 Hold your mag upside down and insert the silicone spray straw into the fill port and spray once or twice. Leave your mag upside down for a few minutes so the oil can get to the fill port gasket. Don’t spray and immediately try to fill your mag with gas. It’ll cause problems and your gasket won’t have gotten any of the oil to it. (Essentially, you’ll have just sprayed and wasted silicone for nothing). CO2 guns and magazines also need to be lubed every once in a while. To do this, take your silicone spray and lube the gasket where the CO2 cylinder meets the gun itself. Wait a few minutes before testing your gun otherwise you’ll have wasted oil and it won’t have been able to get to the gaskets or rubber seals. Slide rails on both gas and CO2 guns need to be cleaned and lubricated regularly to keep your slide running smoothly on the track. Remove your slide and using a clean cloth or paper towel, gently run the cloth along the slide and body to remove any debris and dust. Then lightly spray silicone along all the points where your slide meets the gun body. Not too much!! This will keep your slide from grinding against the body, warping the gun and causing dangerous issues or costly part replacement. If you are comfortable field stripping your gas pistol entirely to clean it, make sure you are using a clean, dry and level surface. Take everything apart slowly to keep any springs from flying off into wayward directions and clean everything one part at a time with a clean cloth. Put your gun back together in the opposite steps as you took it apart and make sure everything slides and glides smoothly. ***If you are not comfortable performing this cleaning on your own, or have lost a part along the way- please don’t fire your gun! Come see an airsoft professional or technician so they can walk you through the steps and ensure you’re using a safe and clean gun. Having a technician perform this task for you will prevent your warranty from being voided and keep your gun in tip top condition. You spent a lot of money on your pride and joy- give it some TLC!